The sun is out, the days are warmer, and my shades are on! 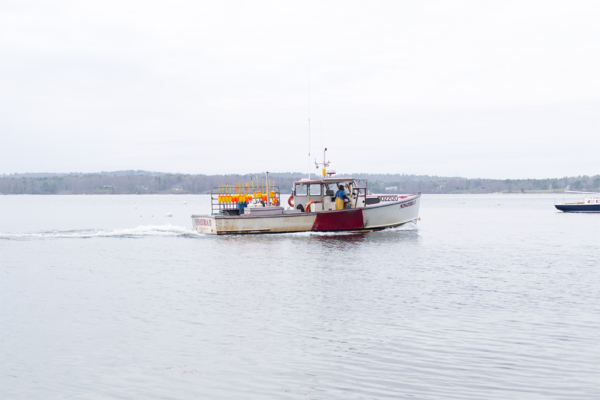 The kids and I have been taking absolutely every opportunity to get outside, move around, and taste the salty air again. 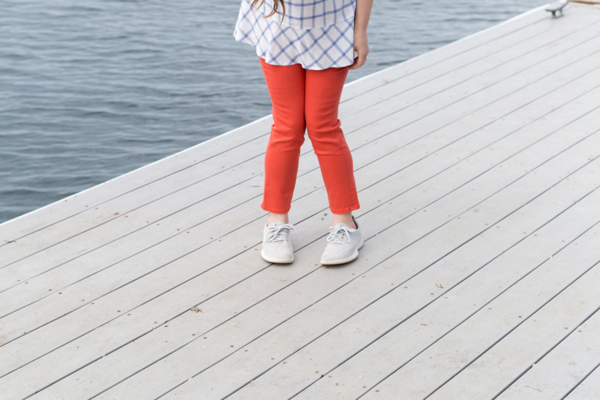 Amid all this glorious time outside, Amanda and I wanted to take a minute to share our new favorite jeans for playing around outside this spring, along with this super fun top we paired them with. In the past I’ve shied away from colored jeans, which feels odd given that I fully embrace chinos and slacks in every shade. Especially if you’re normally partial to a more neutral wardrobe, wearing a bright shade farther from your face is a great way to ease you into color. So many colors that you may not want beside your hair or skin tone can be both fun and look amazing on your lower half. I finally decided it was time to diversify my assets and invest in a more playful palette. We’ve firmly established that Bliss is our denim destination, so Exchange street was our first and only stop on this quest. I tried on a few pairs of jeans, but ultimately settled on the Prima Crop in High White Tangelo by AG Jeans. These are not available from Bliss online, but you can purchase them from either their Portland or Portsmouth location, or if you’re not in the area, directly from the AG website. These are a mid-rise cigarette crop pant, meaning they hit just under the belly button, and have a skinny, but not completely form fitting, leg. I wore a size 28 and found them to be comfortable around the waist and fitted through the legs. There was enough stretch to allow for freedom of movement, but I didn’t notice any shape distortion during the times I’ve wore them. I’ll also note that these are constructed from a lighter weight denim than the Isabelle High Rise Straight Jean we reviewed for the Body Image Campaign. I am forever a fan of poppy reds and can’t wait to pair these with chambray, navy, soft pinks, cool lavender blues, oatmeal, white…really, it just comes down to how bold you want to be with color. Just like a blue jean, they can be easily be worn with anything from a t-shirt to a silky cami and blazer. Lastly, I find the crop to be my perfect spring/summer length. I love having a little bit of ankle peeking out, but still have the coverage I crave to protect me from sun or cold. This slightly cropped length also lends itself really nicely to an ankle strap sandal or one of the summer bootie styles popular this season, but works just as easily with nearly any shoe style, so don’t be afraid to pair it with anything from your favorite canvas sneaker to a classy little mule. 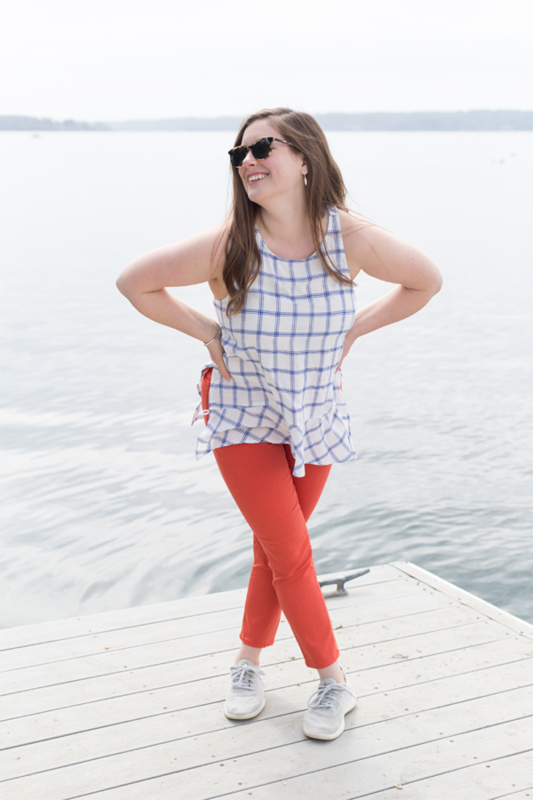 This Bella Dahl top (also found at Bliss, though not available on their website) caught my eye because it was flirty twist on a classic pattern and begged to be twirled in. 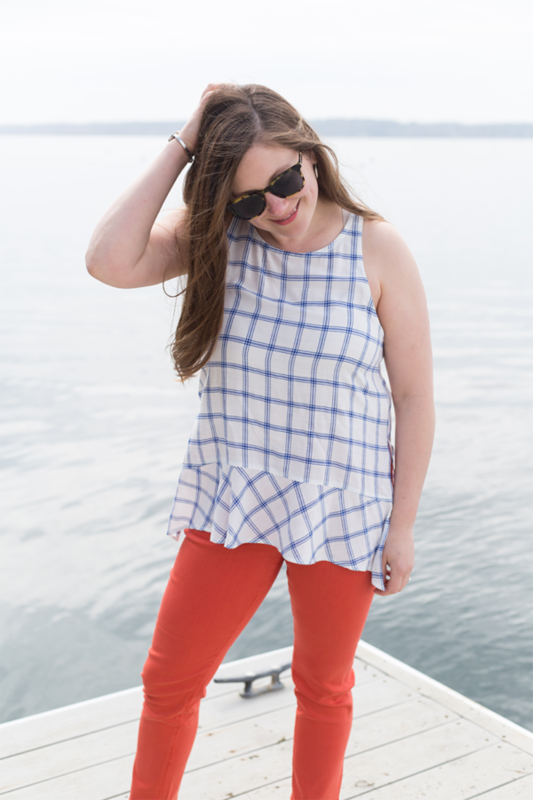 I think my favorite things about it are the oversized windowpane print and the bias cut ruffle. Having the ruffle cut on the bias (the fabric is cut on the diagonal for those not familiar with this term) gives it maximum twirl and I love the juxtaposition of multi-directional patterns; it really adds interest and beauty to the composition of the top. While I’m not completely convinced that the pattern I loved so much on the mannequin flattered my fuller bust, Amanda felt that the right bra was all it needed to fulfill my vision. On that note, fun details such as the key hole in the back, low arm openings, and the narrow cut through the shoulders make keeping your bra covered a challenge. As you can see mine is visible despite our best efforts. We recommend either using a stick-on option, wearing a lovely bra that might match the silhouette or that you wouldn’t mind showing off (maybe something like this), or pairing with a bralette. 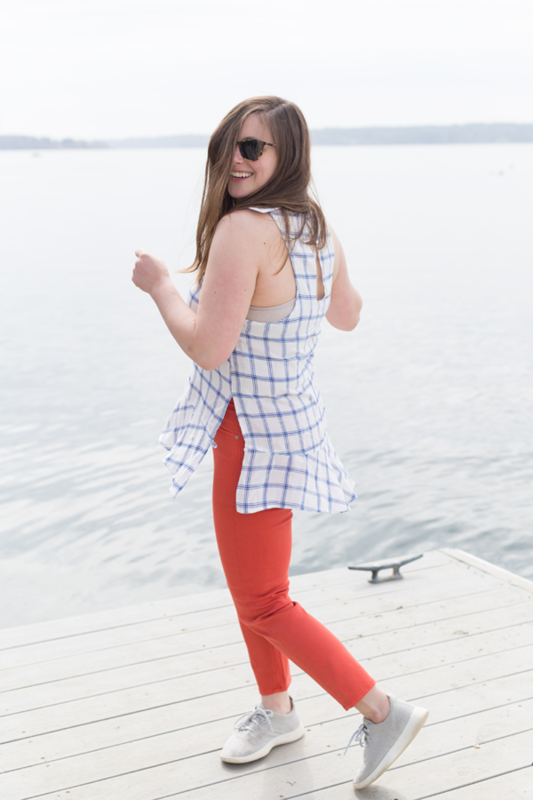 All in all, it was the details that made this top; I also loved the side slits, which used a button as an optional clasp at the ruffle seam to keep things… well… buttoned up. Or you can open it up as I did for maximum movement and twirl. What are you wearing these days as the weather improves? Any new favorites or must haves?